The Galapagos Islands are a magnet for wildlife-lovers from across the globe, and as a result, this small archipelago over 600 miles from the nearest land is one of the most sought-after destinations in South America. In fact, even before Charles Darwin brought the Galapagos to the attention of the wider world, the islands were a regular stop-off point for seafarers and pirates of all descriptions, although sadly their intentions towards the wildlife of the islands were rather more culinary than scientific... Today the whole of the Galapagos Islands are protected by a special National Park and so all cruises in the Galapagos Islands, diving tours, and other holidays are tightly-regulated, with islands designated as off-limits at various times to give them and their unique endemic wildlife some time off from eager, if less swashbuckling, visitors. We've picked out some of our favourite Galapagos holidays here, but all our tours can be completely tailor-made to your requirements, so just get in touch and let us know your plans. 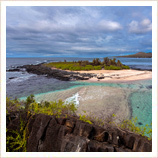 Explore the Galapagos Islands With Us! The island of Baltra is likely to be your gateway to the Galapagos as it is home to the islands' largest airport. Just off the coast of the island of Santa Cruz, whether you're island-hopping or cruising, this is likely to be your first port of call. Although flights now also go from the mainland to the new airport on San Cristobal, Baltra still receives the majority of flights to the Galapagos, and so it's here that you will probably touch down, fill in your Galapagos Transit Card (INGALA) and pay your Galapagos National Park fee, all of which have to be done before you can leave the island. Once all that is done, you will take a ferry across the Itabaca Strait to Santa Cruz, where you will travel on to either your hotel or on to your yacht, depending on the nature of your holiday in the Galapagos Islands. Once you have climbed up to the summit of this small island (which takes no more than half an hour), you are rewarded with a stunning view down to the island's twin bays with their gorgeous beaches, and the incredible Pinnacle Rock: a giant lava spike which towers 150m into the air - it's probably the most-photographed sight in all the Galapagos, at least since Lonesome George sadly left us. You can swim off the southern beach, where you'll share the waters with the sea-lions and penguins who enjoy basking on the rocks around the bay, and although swimming on the northern beach is prohibited, you can still see white-tipped reef sharks and stingrays swimming in the shallow water. From November to January, you'll also often see Marine Turtles making their nests on the beach and wading in the shallow waters, as Bartolome is one of the few nesting sites for this ancient species. The furthest south of all the Galapagos Islands, Española's remote location has enabled several endemic species to develop in splendid isolation. Only on Española do mockingbirds have uniquely curved beaks, only on Española do iguanas change colour during breeding season, and the endemic Saddleback turtles have shells shaped like... well, we're sure you can work that out! Most important of all, however, is the Waved Albatross, for whom Española's steep cliffs are the only nesting site in the world. The cliffs are used as runways for these enormous seabirds as they literally throw themselves into the air, gliding in search of thermal upcurrents. A Waved albatros mates for life and from April to December, Española is packed with courting, breeding and nesting albatrosses and then finally with thousands of little albatross chicks. The recent volcanic activity means that Fernandina has little variety in the way of plant-life, although there are large mangrove forests on the island. Despite the shortage of vegetation, there is plenty of wildlife, but most of it is marine-based. As well as penguins, sea-lions and the large marine iguana population of Punta Espinoza, Fernandina is one of the best places to see the endemic Galapagos flightless cormorants, as they fish in the cooler waters off Fernandina's coast. You can also enjoy trekking up to the lip of the La Cumbre volcano crater to gaze down into the caldera, nearly 1000m below - don't worry, we get plenty of warning as to likely volcanic activity - and great swimming and snorkelling at the newest visitor site in the Galapagos, Punta Mangle. However, Floreana is certainly a natural treasure: as one of the oldest islands in the archipelago, time and erosion have weathered the original volcanic cone, providing rich soils which are full of all the nutrients needed to support the island's flourishing ecology. The headland of Punta Cormorant is usually the first stop for visitors to Floreana, and it has two beautiful beaches: one made up of fine, white sand created by the erosion of coral skeletons; and the other an odd but pretty green colour from the erosion of olivine crystals in volcanic rocks. They are both stunning and are home to different sets of wildlife - the white beach is a nesting site for sea turtles, while the green seems to suit the resident sea-lions. A short walk inland from Punta Cormorant brings you to a small lagoon that is home to flocks of pink flamingos, as well as a large variety of finches and many other birds. You may well also like to spend some time snorkelling at the famous Devil's Crown, where the centre of a collapsed crater is a natural playground for sharks, sealions, sea turtles and shoals of brightly-coloured tropical fish. On the other side of Floreana, you can see part of the island's history at the famous Post Office Bay. This got its name in 1793 when British whaling captain James Colnett set up a floating barrel in the bay for whaling crews to pick up and drop off letters. From then on crews of out-going ships would leave letters in the barrel for the crews of ships heading back to Britain to pick up and take home. This custom continues to this very day so you can even try leaving your own letter to someone, or help someone else's letter reach its destination. Also known as Tower Island, the tiny, horseshoe-shaped Genovesa is a bird-watchers dream. Many birds nest here on Genovesa, including red-footed and masked boobies, frigatebirds, finches, storm petrels and lava gulls. There's a good reason that locals just call it Bird Island! 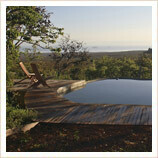 In fact, Genovesa is one of the most interesting of the Galapagos Islands, full stop. With a beautiful sandy, sheltered bay in the south-west, with a lava field rising up to the island's summit in the north-east, it's also one of the archipelago's prettiest islands. You will usually land on the white-sand coral beach of Darwin Bay, right into the midst of an enormous frigate-bird colony, with Yellow-crowned and Lava Herons wading in the shallows. Just back from the beach you can see a series of small pools underneath a cliff edge where lava gulls and swallow-tailed gulls (the only nocturnal gulls in the world) nest. Formed by the eruptions of six separate volcanoes, Isabela is right on the western side of the Galapagos archipelago, with only Fernandina lying further west. Many ships don't travel as far out as Isabela and so it remains one of the less-visited islands, lending it an air of adventure all its own. Visitors to Isabela will usually spend at least two days in and around the island, and the small village of Puerto Villamil offers the chance to stay on Isabela as part of a Galapagos Island-hopping tour rather than visiting as part of a cruise. Puerto Villamil itself is a bit like stepping 20 years back in time to when the Galapagos Islands were hardly visited by tourists - things are still nice and slow on the sandy streets and there's nothing much to do except swim and enjoy a drink in a beachside bar. From Puerto Villamil, you can trek up into the highlands of Isabela to see giant tortoises and to enjoy sights such as the Wall of Tears, built by forced labour when Isabela was used as a penal colony, and on up to the crater lip of the Sierra Negra volcano, from where you have amazing views across the islands. Isabela's coastline is studded with different bays and beaches which all offer something different. On the northern tip of the island, Punta Vicente Roca is a cove formed by an ancient volcano, from where you can take dinghy rides into sunken caves and go kayaking while looking out for flightless cormorants and penguins on the shore, and blue-footed boobies and pelicans on the cliffs above. On the west coast, Tagus Cove was was a historic mooring place for pirates and buccaneers. Around the deep blue bay you can see blue-footed boobies, pelicans, brown noddy terns and swallow-tailed gulls perched on the cliff tops, while marine iguanas and penguins can be found closer to the shore and in the waves. A steep trail takes you through a volcanic landscape covered in scalesia woods and lava cactuses before you reach Darwin Lake, a highly-salted green crater which is home to numerous flamingos. Further south, Urbina Bay allows us to walk on an uplifted coral reef and to see the endemic Alcedo Giant Tortoises that live in this part of Isabela, while in the mangroves of Elizabeth Bay, we can see herons and Galapagos hawks, as well as some superb snorkelling to see various rays, sea turtles and golden mackerel. Located in the north of the Galapagos Islands, Marchena is almost exclusively restricted to scientists, making it one of the most exclusive islands in the whole of the Galapagos archipelago. However, in recent years a handful of yachts have been given permission to include Marchena in their itineraries, and so if you're very lucky, you just may get to go snorkelling at possibly the best site in the Galapagos, at the headland of Punta Mejia. The Plazas Islands are twin crescent-shaped islets formed by volcanic uplift, and lying just off the eastern coast of Santa Cruz. 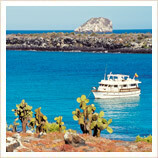 Only South Plaza can be visited, but it's a very popular stop on Galapagos cruises. These twin islands slope gently down towards each other, and are separated by a small channel, like a plate that's snapped in two. North Plaza is restricted to scientific visits, but South Plaza has quite enough to keep us busy from the moment you land. The black volcanic rock slopes out of the turquoise waves, with the orange specks of Sally Lightfoot crabs scuttling across it, while further up the shore prickly-pear cactuses grow, with land iguanas prowling around underneath them waiting for the fruit to drop. The path continues up to the cliffs on the other side of the island, where we can see the nesting sites of Swallow-tailed gulls, Red-billed tropicbirds and Nazca boobies. The cliffs are a great viewpoint for looking down into the clear ocean as well, and we can see rays and white-tipped reef sharks in the water below. South Plaza is also home to one of the largest 'bachelor' Sea-lion colonies in the Galapagos Islands, where scores of young male Sea-lions bask on the rocks and frolic in the waves. If you wonder what Mars might look like, then Rabida might not be a bad starting-point. With its red beach and cliffs, and steep volcanic cinder cones, it's a real other-worldly environment. When you land on the beach you are immediately confronted with a large sea-lion colony, and snorkelling at the eastern end of the beach gives you the chance to see different types of reef fish and the occasional white-tipped reef shark. Meanwhile, inland you can see large groups of finches, doves, mockingbirds and yellow warblers as well as occasional Brown pelicans. The eastern-most island in the Galapagos archipelago, San Cristobal has quite a different environment to the other islands, with a more tropical, humid climate that is reflected in the nature of the vegetation and wildlife. San Cristobal is a regular stopping-off point on Galapagos cruises as it has one of the only two airports in the Galapagos Islands, as well as the islands' capital, Puerto Baquerizo Moreno. The capital is smaller than the largest town in the Galapagos, Puerto Ayora, but it does have a range of hotels, restaurants and shops so it can make a good base for trips to the other islands. There's plenty to see on San Cristobal itself, however. Many visits begin with a trip to the island's Interpretation Centre, which has comprehensive exhibits on the islands' history and ecology. From the Interpretation Centre, a 3km trail leads up to the top of Frigatebird Hill, where you can see both kinds of Frigatebird nesting, as well as some superb views across the island. Also up in the highlands, you can visit the El Junco lake, which is the only permanent fresh water in the Galapagos. In fact, a common sight here are Frigatebirds coming to wash the salt out of their feathers! You can also visit the Galapaguera giant tortoise reserve to make sure you've seen these gentle giants in their natural habitat. Down on the coast, Isla Lobos is always worth a visit, with a large and friendly Sea-lion colony, and some superb snorkelling. The beach at Playa Ochoa also offers some good snorkelling and you can often see Darwins Finches and the endemic Chatham mockingbirds. Just off the west coast of San Cristobal you can also find one of the most iconic landmarks of the Galapagos Islands in the monumental Kicker Rock. This gigantic split monolith towers out of the surrounding ocean and smaller vessels can even sail through the channel in the middle! The largest town in the Galapagos, Puerto Ayora is located on the south coast of Santa Cruz, just a short journey from the islands' major airport on Baltra, and so even if you're setting off on a Galapagos cruise, you're likely to pass through, if only to visit the Charles Darwin Research Station, which for decades has been at the centre of environmental protection efforts in the Galapagos. The Centre is home to the largest giant tortoise breeding programme in the Galapagos, although sadly the most famous resident, Lonesome George who was the last remaining Pinta Giant Tortoise, passed away in 2012. Away from Puerto Ayora, one of the highlights of any visit to Santa Cruz is a journey up into the highlands of the island, where the typically arid climate of the lowlands becomes much more humid and lush. Here we can look forward to seeing lots of varieties of finches, and giant tortoises living in the wild. We can also explore the giant lava tunnels and the twin collapsed craters known as Los Gemelos. Located within sight of Puerto Ayora on Santa Cruz, Santa Fe is only just over a single square mile in size, but a morning or afternoon here may well be one of the real highlights of your Galapagos holiday. The turquoise lagoon of the southern coast has a beautiful white sandy beach, which is home to several different Sea Lion colonies, while you can see Galapagos Hawks sitting on top of the cliffs to either side. A path back from the beach leads up to the cliff tops, where you can see the endemic Santa Fe land iguana feeding on the prickly pear plants that grow here. The two species are in a kind of evolutionary arms race, with the plants growing taller to keep their fruit away from the iguanas, and the iguanas growing bigger to keep up with them! Both are significantly larger than their cousins on the other islands. Santiago's lava flows are nothing short of superlative. The island is made up of two overlapping volcanoes, which over the course of 750,000 years released vast rivers of lava to form Santiago. The best place to see the results are at Sullivan Bay on the eastern side of Santiago, where a huge jet-black lava field forms vast rope-like structures, and where you can see the remains of individual plants and trees captured in the lava flows. On the other side of the island, the lava flows are less recent, and vegetation and wildlife are much more in evidence. A landing at the black-sand beach of Puerto Egas gives you the chance to see land and marine iguanas, as well as fur seals. North Seymour is one of the smaller islands in the Galapagos, but every inch is absolutely packed with life of all kinds so it is a fantastic addition to any Galapagos itinerary. At less than a single square mile, it might not seem like much, but in fact North Seymour allows you to see many of the defining species of the Galapagos all in one place. Cliffs surround most of the island, with swallow-tailed gulls perched on the tops, but from the single visitor site on the southern coast of the island a path leads inland to the nesting sites of Great and Magnificent Frigatebirds, and Blue-footed Boobies. Meanwhile, on the rocks at the base of the cliffs you can see basking sea-lions and marine iguanas, so you're well on your way to completing your Galapagos species tick-list! There is nowhere on earth quite like the Galapagos Islands for wildlife fans. Not only are the islands rich in endemic species, but unlike in many other environments, it's incredibly easy to get close to that wildlife on your holiday, making it possibly the stand-out destination for wildlife-lovers on the planet. On land, the (quite literally) biggest attraction are the Galapagos Giant Tortoises. In many ways these huge creatures are emblematic of the islands, with several of the different sub-species having been made extinct. Most recently, with the death of the famous Lonesome George the tortoises of Pinta Island are also now extinct, leaving breeding populations of only 10 of the original 14 sub-species. Like the islands themselves, however, concerted efforts of conservationists mean that the remaining populations have stablised and are even increasing, so the future for these magnificent creatures looks bright. You can also enjoy seeing the dinosaur-like land iguanas, the quick-moving lava lizards which vary from island to island, three species of (non-poisonous!) snakes, the endemic rice rat, and ten different gecko species. In and out of the water you will see two other favourites of visitors to the Galapagos: sea-lions and fur seals. Both are generally very playful, and on many islands you can enjoy swimming with them. Both the giant tortoises and land iguanas have aquatic cousins, so in the water you can also see huge marine turtles and the spiky marine iguanas. The waters around the Galapagos Islands are incredibly rich, and are home to a whole host of sea life, including everything from several different species of rays and sharks (many of which are perfectly safe to swim with) to vast shoals of tropical fish, as well as sperm whales and bottle-nosed dolphins. There is some fantastic snorkelling to be done here in the Galapagos, and if you already have the qualifications, then there are some world-class diving tours on offer as well. The rich waters attract huge numbers of fish, which in turn attract vast numbers of sea-birds, making the Galapagos a paradise for birding holidays. In fact, the population of seabirds in the Galapagos is reckoned to be around 750,000 at any one time, and even if you're not a birder you'll be amazed by the variety and tameness of the birds you can see on a trip to the Galapagos. Among others, you can see the endemic Galapagos Penguins and Hawks, as well as several different varieties of herons, pelicans, frigate-birds, boobies, gulls, and all 13 kinds of Darwins Finches! The whole of the Galapagos Islands are protected by the Galapagos National Park, and as you might expect they have some very strict regulations about the movement of people, animals and plants to protect this unique ecosystem. Have a look at our guide to the regulations so that you know what to expect, both before you set off and after you've arrived in the Galapagos. The good news for anyone travelling to the Galapagos Islands is that so long as your usual boosters are up-to-date, then you really shouldn't need to have any additional jabs or immunisations, although obviously you should check with your doctor before travelling. Have a look at our Jabs and Immunisations guide to for detailed medical advice. As with mainland Ecuador, the official currency in the Galapagos Islands is the US dollar, and particularly if you are going on a cruise (rather than an island-hopping tour) you will want to make sure you have brought plenty of cash with you for tips and extras. 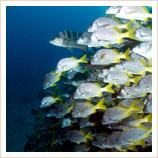 Check out our Galapagos money guide for detailed advice. All of the Galapagos Islands have two names - an English one and a Spanish one. 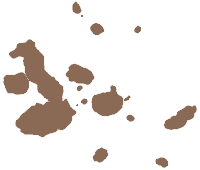 This is because the first ever map of the Galapagos was drawn up by British buccaneer Ambrose Cowley in 1684, and it was those names which went on the official British Admiralty charts.